On Sunday, we decided to take advantage of the nice weather and trailer out for a ride. First we had to get the ponies on the trailer and Levi decided he wasn’t interested in that. First he broke his halter (luckily just the breakaway part), then I replaced the halter and he broke his leadrope. Ugh. I got the rope halter out and he resigned himself to getting on the trailer. I was a little concerned that he might have been uncomfortable on his last short trip and decided he didn’t like the trailer, but – spoiler alert – he hopped right on without issue on the way back, so he was just being an *sshole. While Marsh-Billings is a national park, it’s quite small. There are less than 20 miles of trail in the park, but those trails are lovely. 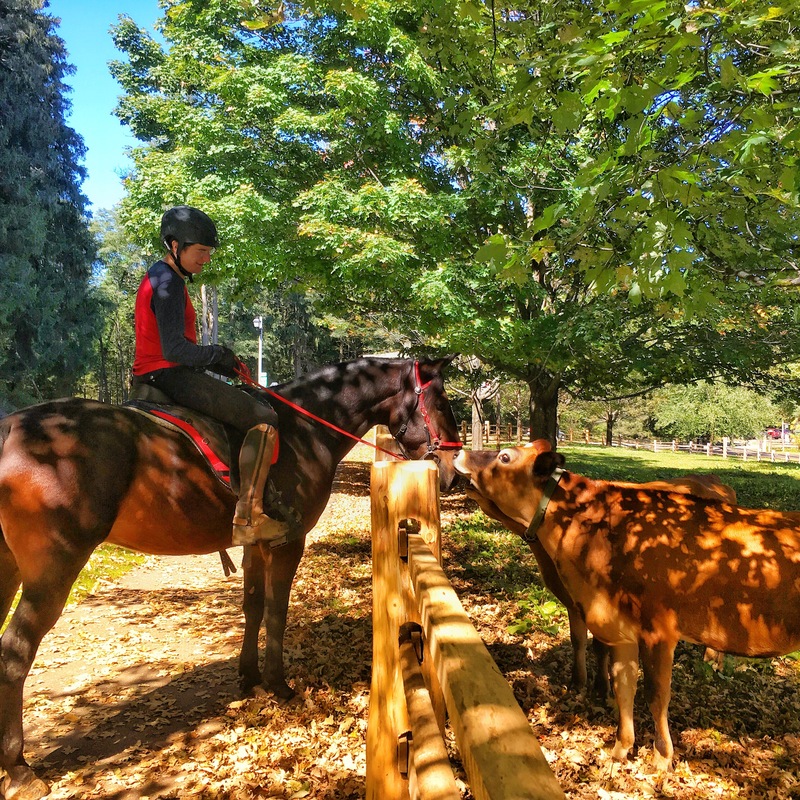 A lot of the trails are very well-maintained carriage trails that you can bring your horse and drive on. I really need to find a driving trainer and finish Nilla’s training. We enjoyed riding the carriage trails as well since they were wide enough to ride side by side. The park is connected to The Billings Farm Museum, which is a popular tourist destination. When the trail parking lot was full, we ended up driving over to the Farm Museum’s overflow lot to park there. This was fine, but then we had to ride on the sidewalks past the farm museum over to the park entrance. As we passed the one pasture by the road, we woke some sleepy cows and Levi lost his damned mind. The horse has done cutting before so it’s not like he’s never seen cows before, but you’d think it was an entirely new and terrifying experience from the way he acted. He initially flew backwards into the road. Thankfully no cars were coming and we didn’t die. Then he refused to go anywhere near those cows to get back onto the sidewalk and I had to pony club kick him onto the grass just to get past the cows. Once we got across the road and into the park, we set them to trotting. I think Levi’s trailering and cow stupidity was really just excess energy, because he was being a jigging nut even when I was trying to get one. A mile of trotting up an easy slope took that out of him and he settled down after that. 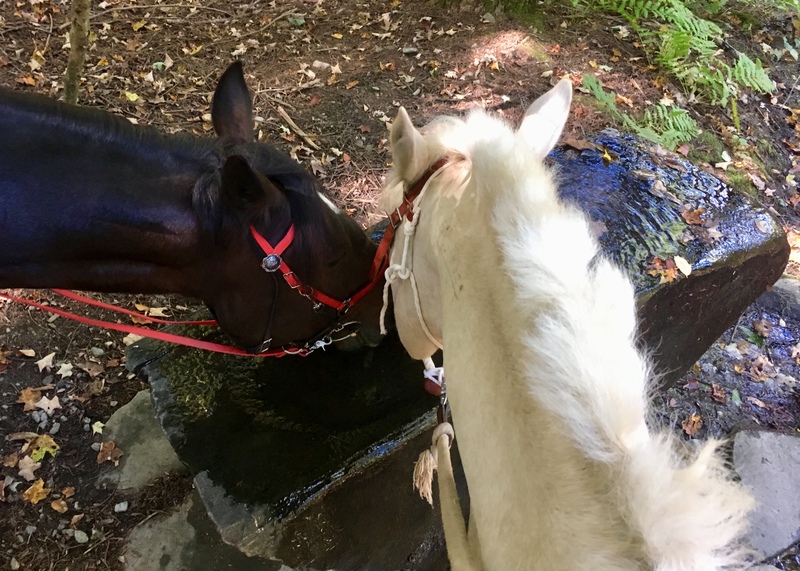 The park has these cool gravity fed water fountains for the horses and both boys were happy to drink deeply. A little bit past the water fountains, we reached The Pogue, which is a pretty lake in the middle of the park. 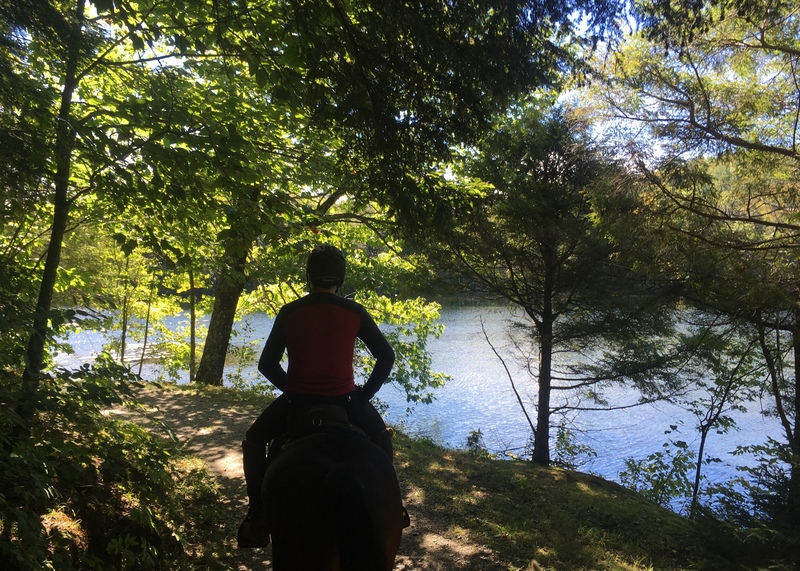 We took advantage of the lovely, cool weather and perfect footing to canter half way around the lake. 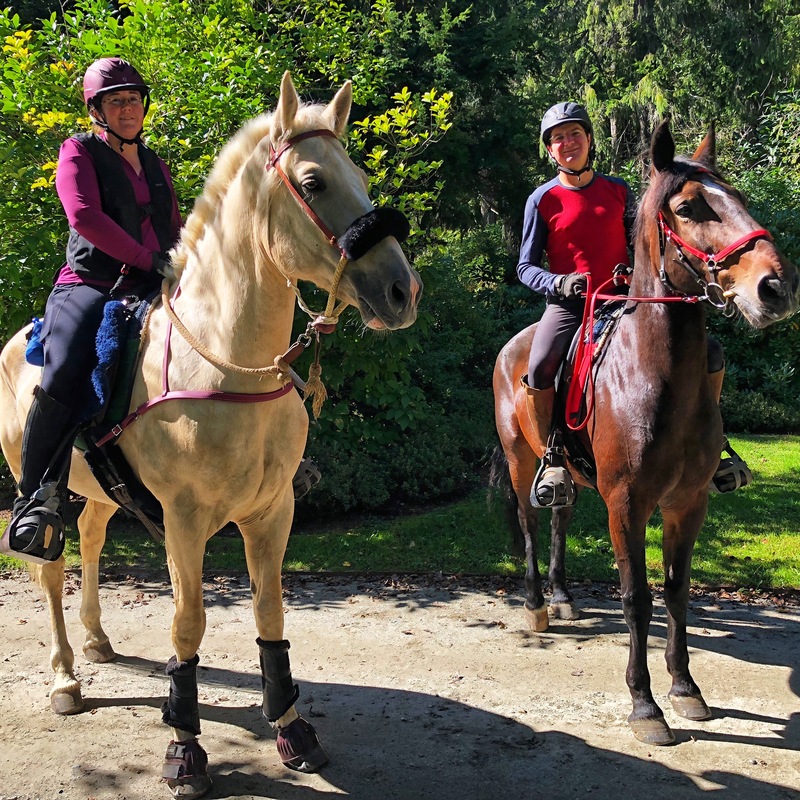 The ponies were both happy to stretch their legs and it was fun to just let the reins loose and relax while cantering along the trail. As we came around the backside of the lake we stopped to let a family ooh and ah over the horses and pet Eugene. Then we left the lake to climb up to the north ridge where the map said there was an overlook. And there technically was an overlook, but it was a bit hemmed in by trees so you can’t see much. Although small, this is a seriously gorgeous park. 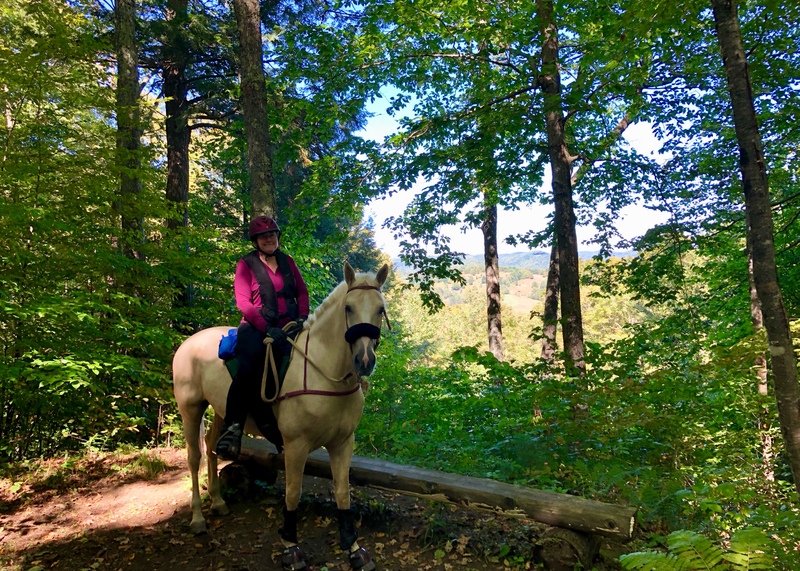 We were both loving the trails and thinking we’d like to come back in a few weeks when more of the leaves are changing. We still had a lot of chores to do that day so we decided not to ride up to the top of Mount Tom (next time!) and head back. We took a different trail back to the entrance and ended up in the middle of the mansion area. There were lots of buildings and people everywhere and we started wondering if horses weren’t supposed to be there. But we hadn’t seen any signs saying no horses. Then we saw a ranger and my husband thought she was going to scold us, but no, she wanted a picture! We asked he to take one with our camera too. As we left the park and passed the cow pasture again, I asked my husband to stop for a moment. I hopped off and led Levi over to the fence to let him see that it was just cows and not demons. The cows were super friendly and came over to the fence to say hi. Eugene was equally interested in the cows and had his head over the fence to greet them. The one cow was licking him and Eugene, who loves a good game, started playing bitey face with the cow and the cow was loving it. Eventually we dragged Eugene away from his new best friends and took the ponies back to the trailer, untacked, loaded them up (no issues) and went back home. It was a great ride and I look forward to getting back to the park in the future. YOu are definitely settling in well. I am not sure how much grass Levi is on now compared to before but this time of year it is much higher in sugars because of the ‘stress’ of the colder weather. It can definitely impact energy levels. That may be a contributing factor. We’re still slowly upping the amount of time they spend eating grass, but given that Levi was on zero grass before, he’s on a lot now. What fun! Those water troughs are super cool. I love Levi’s short mane right now, and in general both horses look great. I need to trim his mohawk up as it’s starting to wobble over, but he does look good with the mohawk. Looks like a fun day! Glad Levi relaxed and let you have a good ride once he got that energy out. He was really good once he got over himself. I keep imagining that one day he’ll grow up. Trails look amazingly lush, id take 20mi that to 100mi of dead grass any day lol. pretty! 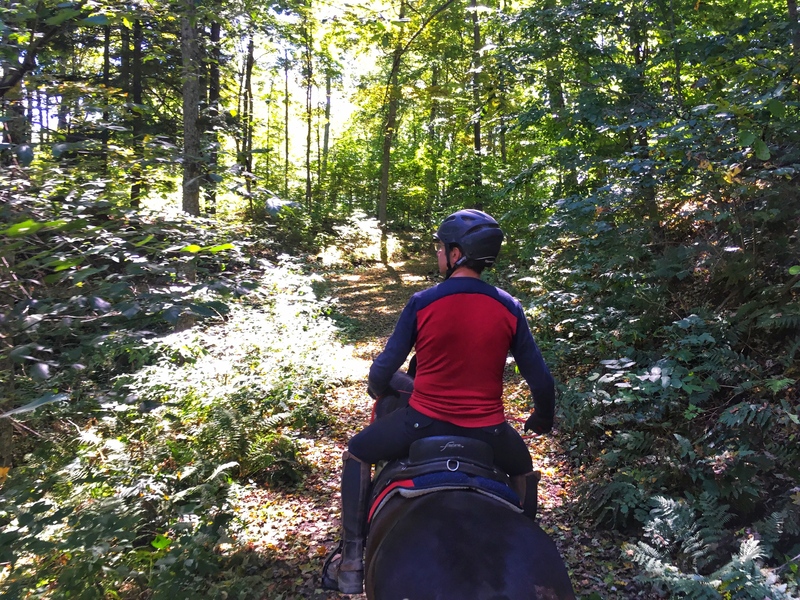 Can’t wait for the trail rides with fall foliage photos! The trees are already starting to turn. It’s getting pretty here. I think most East Coast parks are a lot smaller than you’re used to. But pretty in their own right at least! I bet that place will be amazing once the leaves are changing. 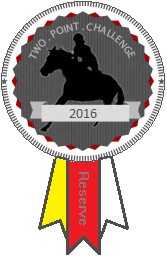 Glad you’ve been able to get out and enjoy the horses while you settle in! That’s true, but I still think of national parks as being bigger. It’s a lovely park though. Bitey face with the cow is hilarious. So, so pretty there!